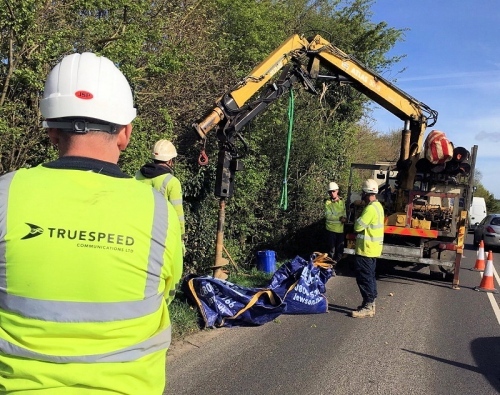 Rural UK full fibre ISP TrueSpeed appears to be in the process of extending their Gigabit broadband capable Fibre-to-the-Premises (FTTP) network to the large village of Peasedown St John in Somerset, which is currently home to a population of around 6,500 and would mark one of their biggest areas to date. The provider’s website states that they’re still in the process of trying to attract 30% of premises in the village to provisionally sign-up (demand-led commercial deployment), although a new Bath Echo report confirms that work has already started with the installation of a new connection box on Wellow Lane. Apparently the initial focus would involve bringing their fibre optic cable to the local St John’s Community Hall, which could be seen as the first step on the way to reaching out more widely across the rest of the village (provided enough people show their interest). The move also appears to have some support from the B&NES Council’s Community Libraries initiative. At present much of the village can already access a Fibre-to-the-Cabinet (FTTC / VDSL2) based service from Openreach, although this tends to deliver significantly slower and less reliable broadband speeds. “We met up with Neil and the team at TrueSpeed recently to discuss plans to install their internet at St John’s Community Hall. The provider, which hopes to cover 75,000 premises in parts of rural South West England by 2021 and holds an aspiration of 200,000 by 2025, is currently being fuelled by an investment of £75m from Aviva Investors (here). So far most of their initial deployments have focused upon communities in and around the Chew Valley area but they also have plans to go well beyond that (here). More likely they will run their cables into Combe Down first,as closer, Frome is at least 10 miles from Dunkerton Hill,so likely they head towards Buckland Dinham,then on to Frome. There is a village meeting soon where they will try to achieve a 30% sign up for an area. There are some EO lines so could be some interest. Would think they go towards Radstock,could then include Clandown, before heading out to Writhlington,got a few friends in Faulkland & Norton St Philps who are intrested in Tru Speed,so easy job to run from Terry Hill crossroads along A366 to Faulkland, Norton St Philip & on to Hinton Charterhouse.